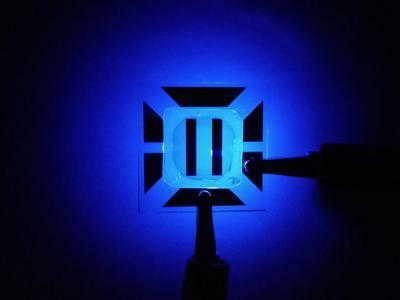 Researchers at the University of Michigan developed a new deep-blue energy-efficient phosphorescent OLED (PHOLED) emitter. The researchers say that this is the brightest deep-blue PHOLED ever reported - in fact it is about 10 times brighter than previous deep-blue PHOLEDs. The lifetime of this material is still very low, and future research will attempt to stabilize the molecule. The new emitter is based on a N-heterocyclic carbene iridium-III complex molecule. This is an efficient compound because its design reduces the chances that light-emitting excitons will either get lost as heat or destroy the compound itself. This research is sponsored by Universal Display Corporation and the U.S. Air Force.